This photograph of Magherabeg National School was taken on the 15th September 1922. At the back are Lizzie Cameron, George Bell, Lily McDonald, Jean Shaw, Sadie Cavan, Cassie Brownlees and Martha Orr. In the third row we ahve Jim Orr, David Carson, Bobby Adair, Willie Orr, Tommy McDonald, Kathleen Carson and Miss Mullan the teacher. Second row consists of Jack Rowan, Robert Currie, Rose Currie, James McDonald, Jack Cairns, Maud Carson and Alwyn Clarke. Seated at the front are Josiah Currie, Martha Houston, Sam Houston, Robert McVeigh, Rose Carins, Artie Clarke and Aggie Rowan. 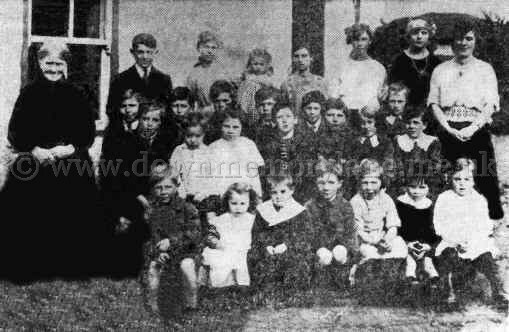 Now this photo of Magherabeg Primary School is a bit of a mystery, thought to been taken around 1926 - 1927. The teachers are thought to be Miss Johnston and Miss Eaton but the names of the pupils are all unknown. So start scratching your heads and start ringing me with some names and bring this photo to life. 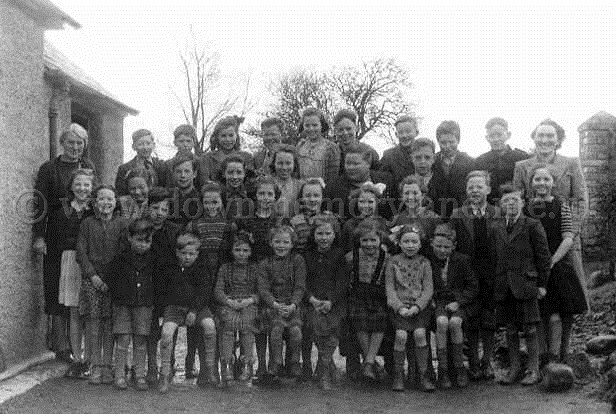 This is Magherabeg Primary School children getting their photograph taken in 1953. In the back from the left are Miss Marquess (Teacher), Maurice Stirling, Joyce Allen, Benny Brownlees, Ruth Ramsey, Margaret McClean, Margaret Currie, Tommy O'Neill, Tom Bradley, Bertie Houston and Miss Johnston (Teacher). Next row we have Tommy McDonald, Nellie McClean, Martha McClean, Ina McClean, Margaret Carson, Sadie McDonald, Jean Brownlees, Caroline Mayberry, Agnes Spence, Thelma Robinson, Eileen Ramsey and Alan Spence. Seated are Raymond Selfridge, Tommy McDonald, Eileen Houston, Evie Mayberry, Jean Fulteron, Prudence Mairs, Nellie McDonald, Pamela Mayberry, Marlene Lynn, Betty Fulterton, James Agnew and Wilbert Selfridge. On the ground are Sammy McBurney, George McDonald, David Huston, David Hamill, Jim Stirling and Victor McDonald. 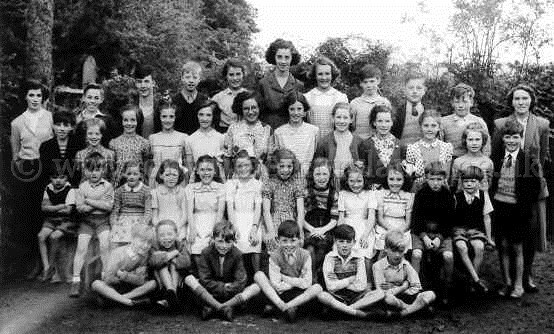 This is Magherabeg Primary School children getting their photograph taken in 1950. 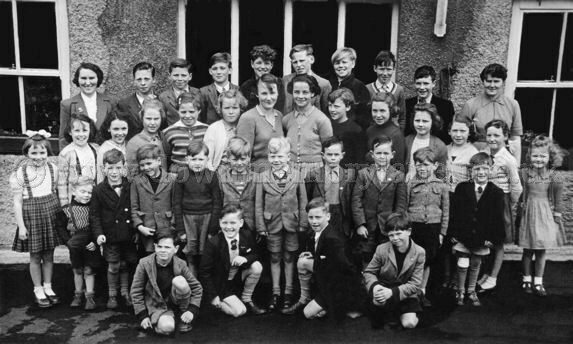 At the back are Alan Hanna, Tommy O'Neill, Ruth Ramsey, Bertie Houston, Jean Brownlees, Richard Millar, William McDowell, Sammy McDonald, Sammy Ramsey and Miss Johnston (Teacher). In the next row are Miss Anderson (Teacher), Margaret Carson, Sadie McDonald, Jackie Allen, Margaret McClean, Mary Brownlees, George Hill and Jackie McKee. The next row has Agnes Spence, Tommy McDonald, Martha McClean, Ina McClean, Margaret Currie, Mabel Hanna, Coroline Mayberry, Benny Brownlees, Allen Spence and Thelma Robinson. In front are George McDonald, Victor McDonald Jean Fullerton, Nellie McClean, Eileen Ramsey, Nellie McDonald, Pamela Mayberry and David Houston. 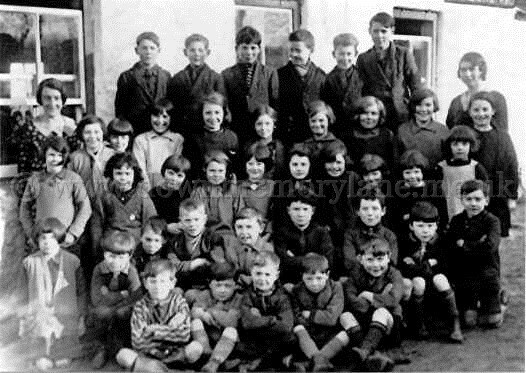 The school building is on the left and this is their playground, now Jean Fullerton who is 3rd from the left in the front row was one day swinging on the gate you can see to the right when all of a sudden the brick pillar collapsed trapping Jean beneath it. Thankfully Jean survied but didn't swing on gates again. This is Magherabegh Primary schoolchildren with their teachers getting photographed outside the school. At the back are Mrs Johnston (Teacher), Benny Brownlees, Geordie McDonald, Sammy McBurney, Everett McCan, David Houston, John McCan, Jackie Agnew, Alan Spence and Miss Marques. In the middle we have Beatrice Barkley, Betty Fullerton, Jean Fullerton, Eileen Ramsey, Nellie McCosh, Emily McCan, Margaret Currie, Martha McClean, Nellie McClean, Pamela Mayberry, Marlene Lynn, Effie Mayberry Eileen Houston and Lillian Lynn. The front row has little David Selfridge, James Agnew, John Selfridge, Billy Mayberry, Alfie McDonald, Bertie McDonald, Gaston Currie, Robin Currie, Raymond McCan and with knee bandaged is John Clark. Kneeling down are Raymond Selfridge, Tommy McDonald, Victor McDonald and Wilbert Selfridge. 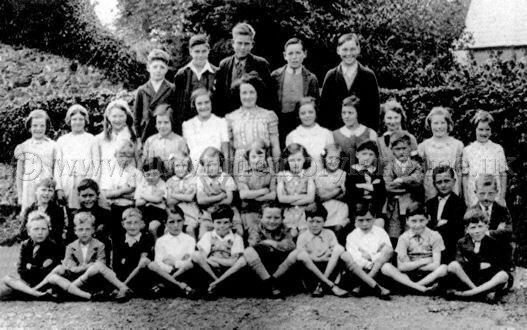 All smiles for the camera we have the class of 1939 from Magherabeg Primary School. Beth McKee, Maisie McVeigh, Ester Hanna, Isa McKee, Nan McKee, Muriel Kelly, Mary McDonald and Mary McDonald. Josie Hanna, Billy O'Neill, Robin Allen, Jason O'Neill, Jack McDonald, Robert O'Neill and Gordon Spence. Standing outside their home at Magherabeg is the McDonald family. 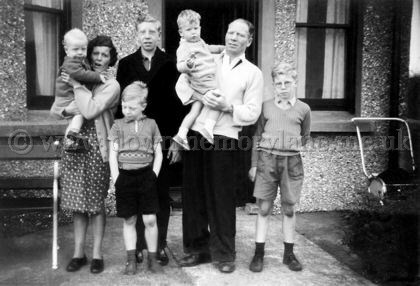 On the left is mother Ina with William in her arms, beside her is Bertie then father Robert with Alan in his arms and then James. Standing in front with his hands in his pockets is David who probably wants to be away playing.